Welcome to the http://stephaniefulke.blogspot.com /">TracfoneReviewer blog! This post will share specifics on how data works on smartphones with Tracfone. Be sure to also take a look at some of our other posts while you're here. 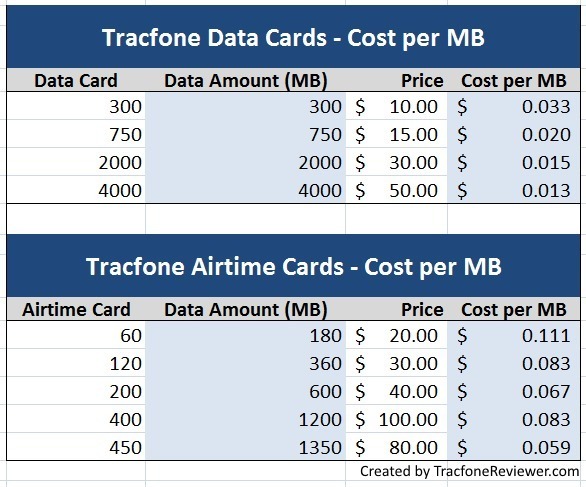 Update - Some of the prices and information in this post have changed, take a look at our new article, http://stephaniefulke.blogspot.com /2016/07/new-priceschanges-to-tracfone.html">New Prices/Changes to Tracfone Smartphone Cards to learn more about the changes to data prices. Tracfone is a prepaid cell phone service provider that offers both phones and airtime cards. On their newer smartphone devices, you also get data when adding an airtime card which you can use to surf the web when not connected to free WiFi. Data is very useful on smartphones, but how does the data work on Tracfone smartphones, how can you get more, and what can you do with the data you have? We are going to cover these questions and more in this post sharing all the details about how Tracfone Data works on smartphones. Some of the popular smartphones that Tracfone offers include the http://stephaniefulke.blogspot.com /2015/06/lg-power-l22c-tracfone-android-review.html">LG Power, the http://stephaniefulke.blogspot.com /2014/10/lg-ultimate-2-l41c-tracfone.html">LG Ultimate 2, and the recently released http://stephaniefulke.blogspot.com /2015/07/lg-sunset-review-tracfone-gsm-4g-lte.html">LG Sunset which uses 4G LTE service on GSM networks. Or you might be interested in the http://stephaniefulke.blogspot.com /p/tracfone-byop-phone-list.html">Tracfone BYOP program, which allows users to bring their own smartphone. Follow the link to learn more, and see a list of the possibilities. Both the smartphones offered by Tracfone, and the BYOP devices, use data in the same way. So let's get started looking at how data works on these phones. What is Data on Tracfone Smartphones? Data is the term generally used to describe the amount (usually in megabytes) you can download or upload on your smartphone via the cell phone network. So data is basically information you download or upload from the internet. This can include many different activities, like checking email, posting photos on Facebook, reading webpages, or watching videos. On older, non-smartphone devices, data was used at a rate determined by the amount of time you were on a website, but this is not the case for smartphones which is a nice improvement. How Can you Get More Data for your Tracfone Device? Airtime Cards - You get an equal number of Texts, Data and Talking minutes in various amounts from 60 to 450. For most situations you will probably want to add an Airtime card to your phone to increase all your 'buckets' of talk/text/data. But sometimes you may only want to add data, in which case the data only cards are useful. Let's take a closer look at Data cards to better understand how to use them. What Are Data Only Cards? As mentioned above, Data cards increase the amount of data for your smartphone, without adding any additional texts or talking minutes. This is similar to the http://stephaniefulke.blogspot.com /2015/04/how-to-buy-only-texts-for-your-tracfone.html">Text only cards we recently discussed. There are some important things to be aware of the make the Data cards unique. First, they can only be used with smartphones, including the Android devices offered by Tracfone, and all phones offered through the BYOP program. Second, in our testing, Airtime cards will triple for all smartphone devices, while the Data cards do not, so be aware of that when choosing one or the other. This doesn't necessarily make the regular Airtime cards a better deal, but we will compare the costs for each card next. Straight away we can see that the Data cards cost between 1 cent and 3 cents per MB, with the largest card, the 4 GB (4000 MB), the best value. If we look at the regular airtime cards and run the same calculation we see they are not nearly as good a deal for data. However, we are totally not incorporating the additional Text/Talk time you get with the regular Airtime cards from Tracfone. We are only looking at which card is a better deal for purchasing Data. It is interesting to note that the 450 Minute Card is the best value for the Airtime Cards. We can conclude then, that if you are only in need of extra data, the 4 GB Data card is the best value. 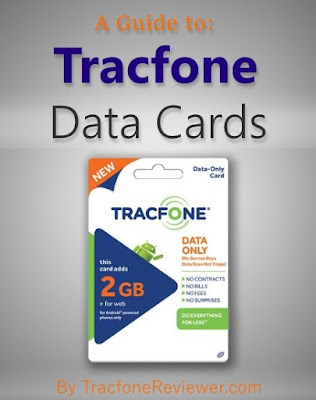 Tracfone Data cards are available form a variety of sources, as is the case for Tracfone Airtime cards. You can find Data cards on the Tracfone website under Airtime. You can also find the Tracfone Data cards in many retail stores, and even online through other retailers. We have found Data cards on eBay in various amounts. Now let's cover one more question that we see asked quite often. How Much Can you Do Online with 300 MB of Data? A common question we see is, what can you do online with a certain amount of data? This is a very good question, because many people tend to estimate how many airtime minutes they will need, and then buy the airtime card that suits their needs best. But if you're unfamiliar with how much data is used by smartphones, it makes it hard to estimate. From this table we see you can visit about 245 webpages with 300 MB of data, or send/receive about 4000 emails. Hopefully this information will help you gain a better understanding of how data is used with Tracfone, and where your data is going. If you notice, doing certain things online, like streaming music, or even more so, streaming video, will use your data quickly, while visiting webpages or sending emails, especially those with few images, will use less of your data. Another good resource for estimating your data usage is the Data Calculator on Verizon's website. Enter your estimated activities, and it will tell you about how much data you will use in a month. Remember, that if you want to stop using data, you can usually go into the settings on your device, select data, and turn it off. Using WiFi networks, like at your home or work, does not deduct from your data. Here is a helpful article on what online activities use data, and some other basic details about data usage from an AT&T Forum. We hope you found this information helpful, and please leave a comment with any questions, or if you have something to add! Find us on Facebook and join over 1200 followers who get the latest news and updates. Take a look at one of our other popular posts, the http://stephaniefulke.blogspot.com /2014/12/best-apps-for-tracfone-android-users.html">Over 30 Great Android Apps to use with your Smartphone. we feel the information How Data Works on Tracfone Android Devices that's all. hopefully the information How Data Works on Tracfone Android Devices that we have conveyed can provide benefits for you and all visitors of this blog, if any criticism and suggestions please comment. you just read How Data Works on Tracfone Android Devices if this article is considered useful and you want to bookmark and share it please use the link https://stephaniefulke.blogspot.com/2015/08/how-data-works-on-tracfone-android.html and what if you want other information look for another page in this blog.